Shopped, sorry. Here's the original: http://lh4.ggpht.com/_Qogq3ys5M8M/S6rDp4R-q8I/AAAAAAAADmw/aOFJQ-RIRWg/tumblr_kx79kfAMgI1qzerw1o1_500_large.jpg Still awesome though. Or maybe the original IS the shopped one, hmm? i knew that cat cannon would work! Perfectly timed, or moderately well photoshoped ? HA! This time i will break the wall of sound for sure! 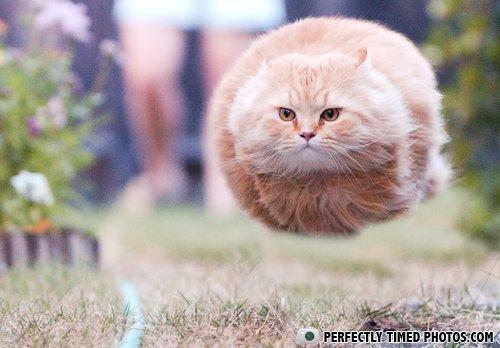 Have you seen my floating cat anywhere? His name is Cheshire. This Was Not In My Job Description. This is a fake!!!!! It's been Photoshop to remove the legs, this isn't perfectly timed at all.